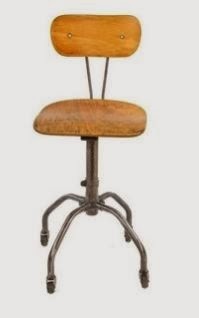 And you can have your say..
Over 40 stools to look at.. all different types..wonderful..
Vote here, between < click this link > to take you to the voting page.. Here is a preview of the stools with there respected number.. So there you have them.. I'll be perfectly honest with you, there are 5 that I would welcome in my workshop or home..
Vote here, click this link..
A bit of a late start today, got into the workshop around 9 am.. later than I wanted, but I had time to think about what was sorted, and what I needed to get done. The first thing to do was to get the joints of the boss' all done and get them glued up to the legs. I had already got two done, so only four more to do. But there was one thing that I needed to check out.. I knew that I couldn't just put two boss's any old distance apart..they were both going to be joined by the threaded spindle. So when the positions were marked on the legs I had to ensure that the boss' were on the threaded spindle then around the correct distance apart. I chose around 125 mm, this is 25 mm more than an Ikea piano stool shown in Part 1. I wanted this extra 25 mm so that the threaded spindle would have less play, one of the issues with that stool..
Today is the end of Day one.. I knew that I had pushed some of the boundaries for me..and this was never going to be an easy build.. The legs are out of 1" White Oak planks, cut into thin strips to enable me to bend them to fit my former or mould. The first thing I had to do today was get the 3rd leg out of the cramps and run the three of them through the planer.. down to just over 20 mm, and that went great, they are starting to look really cool.. The stool is going to be viewed from all round, and I want it to perform as a shop stool but also create a talking point for visitors and clients. So it's important to me that as you walk around it the section looks fluid..and it will. If you follow me on Twitter then you may already know..
A few weeks ago Chris Wong who is a wonderful woodworker from Vancouver, Canada..and I follow on Twitter. Asked if anyone was interested in building a stool for their workshop. He needed a new one and after a couple hours, I think there were three of us who had said "yeah great lets go for it.."
The idea was to have a Build Off, I think Chris had done this before with other projects. Design an item, then make it in a period of time, a weekend. 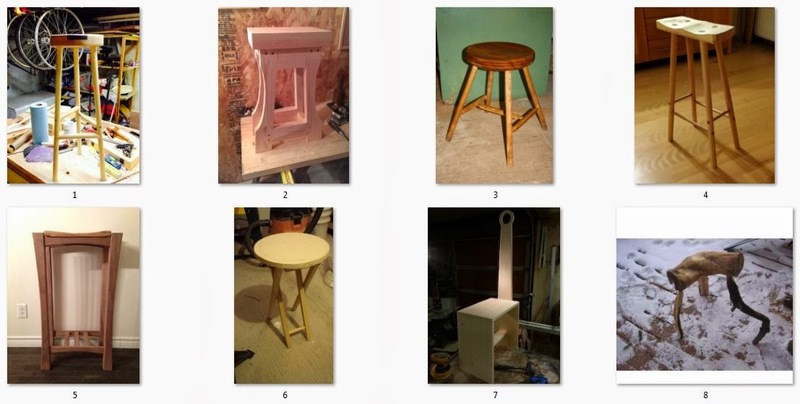 When every type of professional to hobby woodworker could have a go..The weekend for the stool. 25~26 January 2014.. There was a prize.. someone would be the winner. I thought that just taking part and maybe I might be in with a chance of winning..Now that was fine for me just to be called the winner, and there are only a handful of guy's doing this..so yeah I'm in with a chance..(if I did win of course..much chance?..read on). Every now and then, I get to walk around the centre in search of someone or something.. This one day there was a guy hiring the blowing studio..doing some great pieces with Ian Bamforth assisting him...after introductions, Graeme Hawes told me he had a lump of Cherry in his shed that he wanted to be made into paddles for flattening the bottom of items as they were being blown. His was uneven and had a hole in it !! So he used another part of the paddle..
A few weeks later Graeme dropped off the log, no splits or shakes, just hard, very hard, much harder than some of the American Cherry I have, and this piece was from low down in the trunk.. 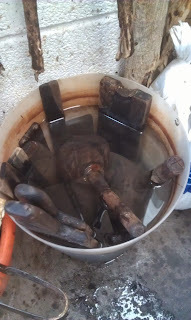 This is normally where you find the paddles In a bucket of water.. Here, Vic Bamforth is using a paddle to flatten the base of a vessel.. each Glass worker has the tool made to suit them or the timber they get..then it's part of their tool kit. The Incredibly Wobbly Windsor Chair..
An antique Windsor chair has come into the shop to be re-assembled. The chair has been in the family for three generations. And I would say it's time this beauty had some tender loving care. The chair was still in use, and when you sat on it, it wobbled to the right about 3 to 4". It really was quite scary. Now, I'm loving this chair, it's got so much going for it, the colour and patina is fabulous..
Look at these joints..all loose and worn out from the last 40 years of being loose..
You can see where the spindles have gone through the seat, with the wear showing..removing the patina..
More damage..Tricky under here..I won't be showing my method of fixing this, some you just don't give away..
and there was some wear to the sockets and holes..